I know keeping to your wedding budget is important to you and at the same time finding the perfect wedding dress is also high up on your list. Thankfully you don’t have to compromise on either, unless that is you want the latest designer dress by the designer. We all know that you can get copies from places like China but finding the real thing for a bargain is hard, if not impossible. These are my absolute favorite online dress stores for finding a gorgeous and cheap wedding dress. They all have lots under $100 and they do ship internationally. Check out all of the fab discounted wedding dresses at Light In The Box at the moment, plus they also sell a lot of favors and accessories as well. Amazon as you can probably imagine has a vast range of dresses for under $100, some are even under $50. There are also a number of big name bridal stores selling on Amazon at the moment so it is well worth a look. Here are all of their dresses for under $100 available at the moment. If you are wanting a designer or more expensive wedding dress for less then you will need to have a look at secondhand dresses. plus local facebook wedding groups. Older dresses will likely sell for less than a more recent dress. If you think about it wedding dresses haven’t really changed that much in the last 10 years so if you love it, go for it! 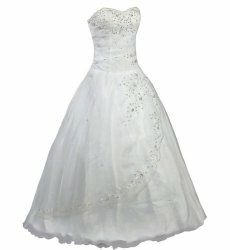 If you are planning a vintage wedding and love the vintage look you are more likely to find your dream dress under $100. Or why not ask an older friend or relative if you can borrow their wedding dress.